Georgia Avenue Winter Fest a Resounding Success | Park View, D.C.
By all accounts, the 1st Annual Georgia Avenue Winter Fest was a success. Roughly 1,200 attended the event. While the idea and initial drive to organize this event began with the Georgia-Lamont Avenue Task Force with the help of the Luray – Warder Neighborhood Association, in the end this was a real grass roots effort with too many individuals and organizations to name. In the holiday spirit, it was a community coming together that made this event possible. Even so, the holiday trees were made possible with the help of Annie’s Ace Hardware, the Park Morton Residential Council were instrumental in assisting with the donation of a Christmas tree to the Park Morton community, and Zuckerman Gravely Properties provided use of the building (See Facebook page). I stopped by at the beginning of day as things were getting started and I’m told it only got busier. I was particularly happy to see some of our locale food vendors there as well. I noted both Eatsplace and Kangaroo Boxing Club were there and wouldn’t be surprised if there were others I missed. 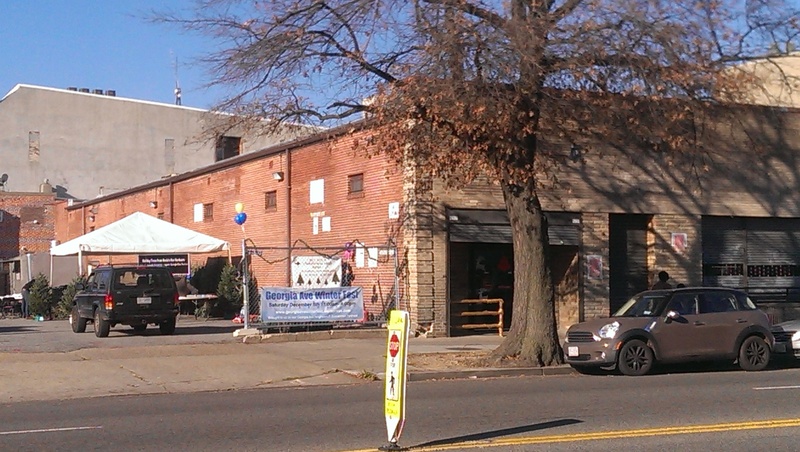 On Saturday December 5 at the old Murry’s grocery store 3400 Georgia Ave NW, members of the community came together to organize the Georgia Ave Winterfest. One of the organizers Jennifer Kuiper invited MPD to bring the Horse Mounted Unit and meet and greet residents. Lt. Mark Hodge of PSA 302 made arrangements for Officer Robin Szewczyk of the Horse Mounted Unit to attend. In attendance were CM Nadeau, Gabriel Rojo from the Mayor’s Office, Rashida Brown ANC, Audra Grant of Luray Warder, Sylvia Robinson of the ECAC, and John DeTaye of CSC. There were food, drink, information tables, DJ, and other services being offered ranging from DC Government to non profit agencies. Congratulations to everyone who organized the event and pitched in to make it a success! This entry was posted on December 7, 2015 at 7:01 am and is filed under Community, Community Involvement, People. You can subscribe via RSS 2.0 feed to this post's comments. Yes, I was there it seemed to be a great success. Kuddos to the organizers and participating businesses! Yes, it really was a great event. Thanks to all our amazing local business participants, sponsors and organizers! I look forward to next year’s. My partner and I intended to check it out and then head to other holiday markets around the city. A few hours later, we finally left after talking to neighbors, vendors and service providers, eating a delicious lunch from Heat Da Spot, and watching some great and fun performances on the stage. So much for hitting the other markets! Thanks to everyone who made this event happen.